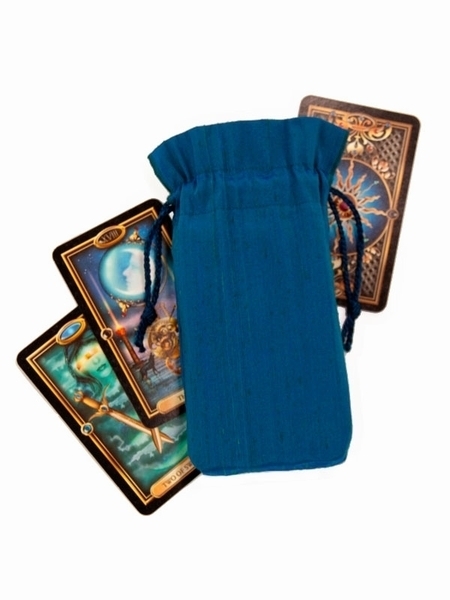 This wave colored silk tarot bag has all the cooling, calming effects of the mysterious deep. Blue is the most soothing color of all. It is the color of water and emotions, and thus is the color most associated with the suit of cups in tarot tradition. It is fluid and intuitive, mysterious and purifying. Why Wave? When light plays on the surface of this silk, it reveals all the hues of dark, rolling ocean wave � marine blue, dark teal, sapphire, royal blue. This silk shimmers with the iridescence of a peacock's feathers.